Listening to music while travelling is a challenge, so your customers will love this printed 2.1 Bluetooth speaker. The round speaker comes with light indication that changes between 3 colours, and it has a rechargeable lithium 450 mAh battery and an SD card port. It also comes with an AUX/USB cable, and it has a hands-free call function. The output data is 3Q, 4 Ohm. It provides fantastic sound in a small and portable device, and it would be ideal for travellers, business clients, campers and anyone who enjoys being outdoors. Our round bluetooth speaker leds are made from plastic and comes in white. Branding available on the upper area as standard.. 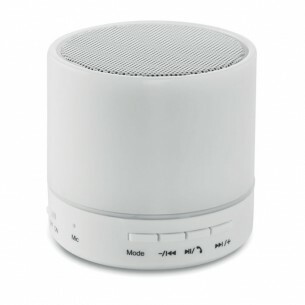 This speaker product is printed in up to 8 colours via doming print, which is a perfect technique for logos or artwork with gradients or complex colour schemes.